The warm and balmy sun, the tranquil blue sea, the rhythmic gushes and gurgling of waves lapping against the warm black sand beaches, the clear blue waters blending with the sky in the distant horizons, the starry night sky embedded with the sparkling celestial beauties, these are nothing but a handful of the innumerable breathtaking beauties of Tahiti. Tahiti, formerly know as Otaheite was formed from volcanic activities. The rocky and mountainous island is situated in an archipelago lying on the south of Hawaii. It is the largest island in French Polynesia. The island is a remarkable formation of nature with two roundish land surfaces, one reasonably bigger than the other, centered at the highest volcanic peaks of Mt. Orohena and Mt. Ronui floating and yet linked by a tiny isthmus, Taravao. Once occupied by the French, Tahiti language, food and even culture is extensively influenced by the French dialect and cuisine. 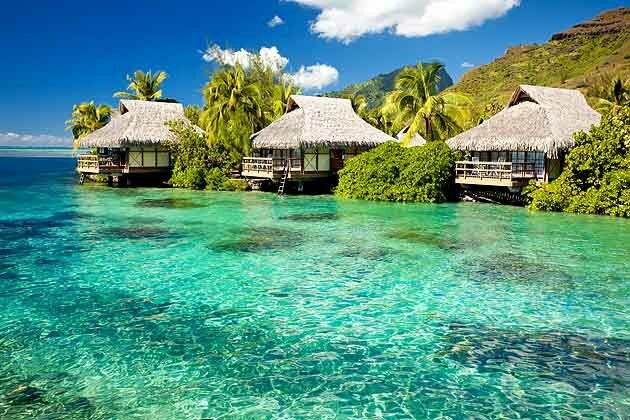 Tahiti, the tropical heaven, is formed of 118 islands dotted across the South Pacific Ocean. Surrounded by the high coral reefs, its rocky surfaces is woven with the greens. The air is perfumed by the local lavender plantations and is lined with palm trees. Tahiti is a divine abode with an overdose of nature, gleaming in the golden sunshine. Each of the islands are unique, eminent with their own characters. The island of Bora Bora is carved with aquamarine lagoons perfect for swims. Upon these still waters, rest the individually hovering wooden bungalows that border the lagoons. The views are breathtaking with the blues and greens, as the colors playfully blend into each other, creating a sight so beguilingly mesmerizing. The Huahine and Taha’a greens of vanilla plantations, Moorea with its rich green cliffs and the wide and warm sand beaches. Your heart is sure to skip a beat captivated by the exquisite under water life and the unscathed coral beds and schools of bright fishes at the Rangiroa and the Tuamotus. This tropical island promises to take you far away from your city life and further away from any other lively experiences as the calm waters overwhelm your senses with experiences so ethereal. The silence is so much like meditation in itself and so much more, to absolutely loose yourself into ecstasy. No drug as compared, would suffice to do enough or intoxicate adequately or awaken enough as this enriching passions of Tahiti. Planning for an exotic honeymoon with your companion or a blissful get away or a hideout from your exhaustive life, safely tucked into a wonderland, Tahiti is sure to quench your thirst with its disarming beauty. Playa del Carmen Vacations – Fantastic Family Fun!